← Do you know of the white-lipped peccary? The wet season in the Osa Peninsula is just that—very wet. For the past three weeks, I have been out trekking in torrential rain, both first thing in the morning and late at night, while working on the sea turtle program. 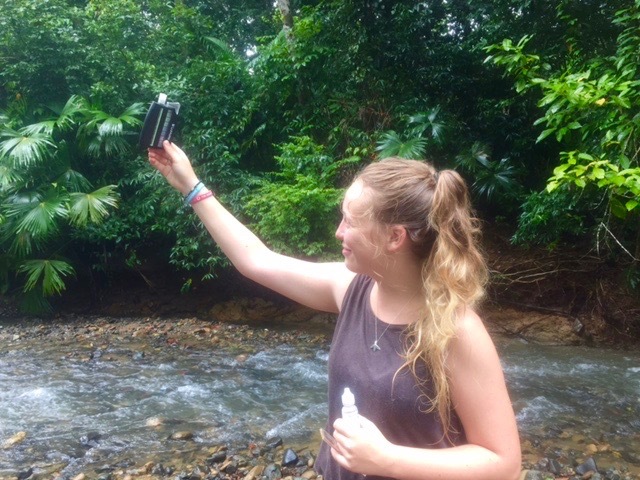 I also had the opportunity to help with various other important field research tasks being carried out by the incredible team at Osa Conservation. One project that I especially enjoyed helping with was the Rios Saludables program, coordinated by Hillary Brumberg. I had fun working in the water and seemed to always be getting wet! Water quality testing here in the Osa Peninsula is incredibly important, as it affects many people in the area. The testing includes looking at the pH, alkalinity, nitrate levels, conductivity and temperature of the water. We set off down to Piro River armed with a big box full of equipment and a homemade surber sampler (a rebar cube used to sample sections of the river with a net attracted to capture interesting river wildlife). Since it’s the rainy season, the river is currently flowing fast, so walking through and along it was a challenge in itself; one which I did not manage with dry feet! With one misstep into a deep section, the river was over my boots and soaking through my socks! Testing the different aspects of river health took about two hours, with detailed instructions to follow for the more complex tests. I looked at the pH and the nitrates while others analyzed other aspects. Good news – Our tests showed that everything was in a healthy range in this part of the river! 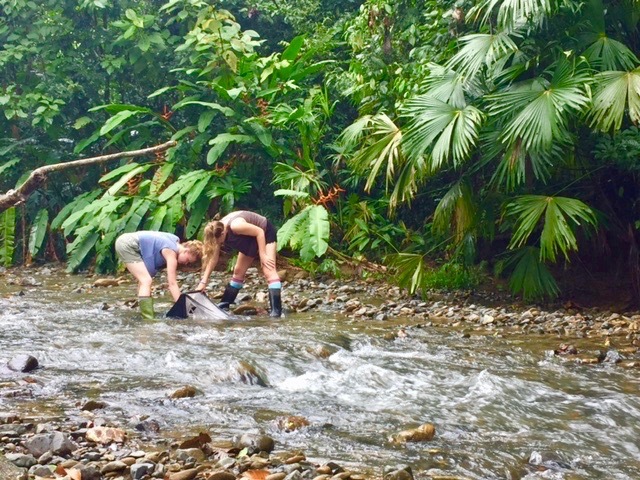 Lastly, we used the suber sampler to gather leaves and sediment from the river bed in hopes of finding some macro-invertebrates. After combing through what we gathered in the nets in five different locations along the river, we identified a couple of species of mayfly before returning them to the water. 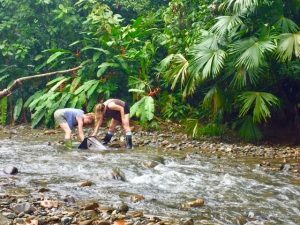 This experience was fascinating and gave me insight into the wider range of research taking place in the Osa Peninsula and a deeper understanding of the importance of this conservation work. I loved it!